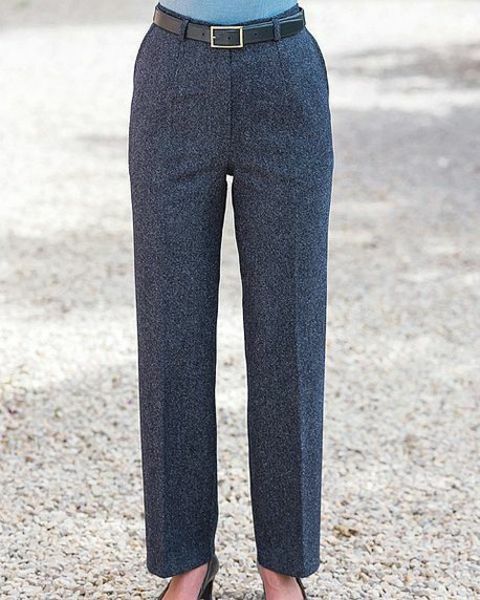 Classic Ladies Wool Tweed Trousers. Sizes 10-24. Length 28",30". Kilmory Medium weight pure wool tweed, woven in the UK in tonal shades of indigo blue. Dry clean only. Half lined flat front style trousers. Button and zip fastening with side seam pockets and belt loops. Side back waist elastication provides a comfortable fit.